Army Combat Veteran Dianisha Hernandez inspires others to chase their dreams by chasing her own as a singer and performer. We only have one life to live and only we can live it. 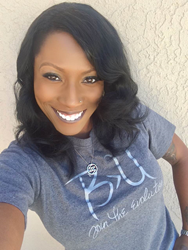 Inspirational website, B>U, selects vocalist Nisha Nandez as their feature of the month for September 2014. Nisha's courage to follow her dreams, after 20 years in the professional world and the U.S. Army, inspires anyone that it is never too late. "We only have one life to live and only we can live it. We should never let our age, time in our life, or any circumstance prevent us from chasing our dreams and being who we are meant to be," proclaims Nisha. Dianisha Hernandez' inspirational journey began after the 9/11 tragedy affected her to change her life and help her country. She left her job at 29 years of age to join the Army in 2003. She auditioned for the Army Band, joined the Army, and began performing for the troops. In January 2005, Nisha's 3rd Infantry Division Band was deployed in support of Operation Iraqi Freedom III. She was assigned guard duty and convoy security. When off guard and security duty, Nisha performed for ceremonies and events. Nisha was lead female vocalist for the Army band that played rock n roll cover songs for events to help boost troop morale. She likes to say one of her favorite concerts was opening for Toby Keith where she sang "That Don't Impress Me Much" by Shania Twain. After 10 years in the Army, Nisha moved to California to write and record her songs. She currently has 17 songs on her playlist and recorded two videos. She was recently accepted as a "Songs of Love" writer for the non profit group providing personalized songs for children who face tough emotional, physical and medical conditions. "Everything about Nisha embodies the giving spirit of being greater than yourself. Whether sacrificing for your country or inspiring others to follow their heart. Thank you Nisha," comments B>U Conductor, Richard May.